This Java application demonstrates animation. This example illustrates the use of a Timer to do animation. The Timer constructor takes two arguments: the delay in milliseconds and the ActionListener that will respond to the Timer's ActionEvents. For the second argument, an object of the inner class TimerHandler is created. This object calls JPanel's repaint function to redraw the screen. 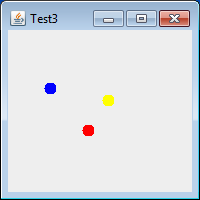 The example here modifies Test2 by rotating one of the ball objects about a point on the screen.